In this IELTS study plan, you will target things that are most likely to increase your IELTS score. You’ll also want to avoid things that won’t be so helpful. To learn more about why a study schedule is so valuable, check out the video below. For instance, at this point, you should definitely NOT spend a lot of time studying English grammar or practicing pronunciation. You simply don’t have enough time to make significant improvements in these areas. Instead, you should prioritize the goals listed below. If you don’t have time to order practice exam books before your exam, you should download and print your full-length tests. 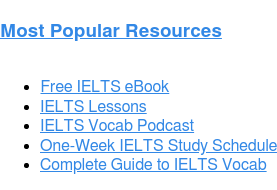 This IELTS practice test post includes some links to downloadable, full-length IELTS practice exams. You will need at least two tests. Click here to download and/or print this study plan. 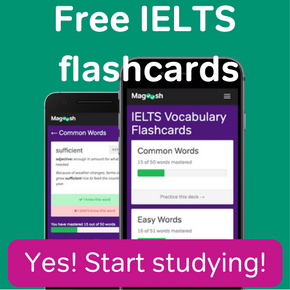 Magoosh’s online IELTS flashcards. They’re free and you can use them on the web, on your iPhone/iPad or Android! A voice recorder for your speaking responses. Many students use their phones to record. This free online voice recorder is another good option. Magoosh students can use the built-in recording function for speaking practice questions. Please note that Magoosh does not give feedback on your responses at this time. A friend to interview you in English for the Speaking section. Item 1: Become familiar with the format of the IELTS exam. You should watch all of the videos in the “Introduction to IELTS” section of your lessons. This module will orient you to each part of the exam so you know, in general, what to expect. You will also learn how the IELTS is scored. Altogether, these lessons will give you a clearer picture of how the IELTS measures your English skills and how the exam is structured. Item 2: Take a “diagnostic” test. If you have time to take a full practice exam today, you should do it! However, after completing Item 1 above, it’s very likely you don’t have the time (and energy) to take a full test. And that’s okay; this is why I recommend most students simply take a shorter “diagnostic test” at this point. A partial IELTS that covers all the sections will help you to become familiar with the exam and your strengths and weaknesses. Below are instructions on how to assemble and take a diagnostic IELTS. Reserve 1:15-2 hours of uninterrupted time (the time will vary depending on whether you complete one or two writing tasks). 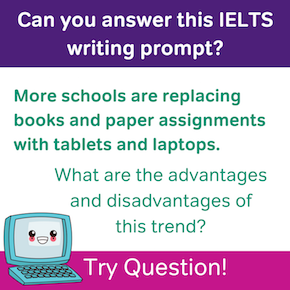 Write (don’t type) your essay responses just like you will on the IELTS exam. Set strict time limits for the reading questions and the writing questions. The following plan relates to the first Practice Test in The Official Cambridge Guide to IELTS. 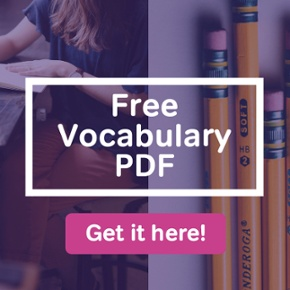 If you do not have this text, you can apply a similar plan to a different practice test if you have one, or find a practice test to download from this blog post. Listening: Complete listening questions 21-40 from Practice Test 1 (pages 157-159). Reading: There are three reading passages in Practice Test 1 (pages 160-170). Choose ONE of the passages and complete the questions related to that passage only. You should complete all questions in 20 minutes. Writing: If you have time, complete both writing tasks for Practice Test 1 (page 171). Just complete one of the two if you are short on time. The first Task should take no more than 20 minutes. The second Task should take no more than 40 minutes. Speaking: Answer all of the Speaking questions on page 172. Record your answers if possible so you can analyze them later! When you finish, make sure to check all your answers and study the sample speaking and writing responses provided. It is critical to approach the IELTS Reading paper strategically. Many students are surprised to learn that, in fact, it is NOT advisable to read each IELTS Reading passage carefully before responding to questions. That approach would take too much time for most IELTS-takers. You can boost your Reading score significantly by utilizing several key Reading strategies. Your Reading video lessons target these skills directly. Reading Lessons: Watch the lesson entitled The SUN Method first. You should also watch the video Finding Information: Skimming and Scanning in the “IELTS Skills” lesson section. The follow-up lessons on How to Skim and How to Scan in the same section demonstrate how to put these key skills to use. If you have time, watch several videos (or all if possible!) on specific Reading question types in the “Reading” lesson section. Even if you only have time to watch a few of the question-type videos, this will at least show you how to apply the SUN Method strategies you learned. Practice: In Magoosh, click the green “Practice Reading” button on your Dashboard. Read and answer all questions for TWO passages. Watch the explanation video for every question you get wrong. Writing: Write ONE essay today. Click the green “Practice Writing” button on your Dashboard. Depending on how much time you have, complete a Task 1 (20 min) or Task 2 (40 min) essay. When you’re done, read the sample essay and listen to the explanation video. Like the Reading section, it’s important to approach IELTS Listening strategically. In addition to becoming familiar with Listening question types, there are a number of general strategies that will help you a lot in this section. Your video lessons cover these points in depth. Lessons: Watch the General Tips and Strategies and APT Method lessons. Also watch the short introductory videos for Parts 1, 2, 3, and 4. If you have time, watch as many of the “Question Type” videos as you can in this section. Try to watch at least two. These videos introduce the various questions types you can expect on the Listening paper. They also show how to apply the strategies you learned in the “General Tips and Strategies” and “APT Method” lessons. Practice: In Magoosh, click the green “Practice Listening” button on your Dashboard. Listen to and answer all questions for THREE to FOUR audio tracks (depending on how much time you have today). Watch the explanation video for every question you get wrong. Practice Responding to TWO sets of interview questions. In Magoosh, click on the green “Practice Speaking” button on your Dashboard. Answer each question the best you can immediately after reading it. Try not to “skip ahead” and look at upcoming questions, since you won’t know the next question on the exam! After completing the question set, watch the explanation video. 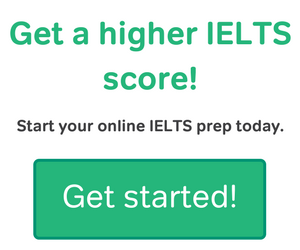 You’ve already done some writing this week, and you’ve already watched some videos on IELTS scoring. Evaluate yourself. How did your writing go? Use what you learned in your lessons to evaluate yourself. Start by making sure you fulfilled the most basic requirements. For example, did you meet or exceed the minimum word count for both Writing tasks? Did you answer the questions directly and fully? It is a very good idea to refer to the official IELTS writing band score descriptors for Task 1 and Task 2 when evaluating your writing. Writing Lessons: Make sure you watch the videos for Academic Task 1 or General Training Task 1 (depending on which version of the IELTS you need to take). You should also watch the video Introduction to Task 2. Other videos in this section will help you plan and organize your essays. Depending on how much time you have today, watch as many as you can! Practice: Take a “full-length” writing exam. Give yourself an hour to complete ONE Task 1 essay and ONE Task 2 essay. In Magoosh, click on the green “Practice Writing” button on your Dashboard. After you write, watch the explanation videos and read the sample essays. Try to evaluate your own writing and consider how you could improve your responses based on what you’ve learned from your lessons and the explanation videos. Make sure to use the official IELTS writing band score descriptors for Task 1 and Task 2 when evaluating your writing. Speaking Lessons: Watch the General Tips and Strategies video and the lessons for Part 1, Part 2 and Part 3 of the Speaking exam. You should also watch at least one of the “Practice Interview” lessons. If you have time, watch the other lesson videos in this section. Practice: You should practice preparing a few (3-5, or more if possible!) responses for Part 2 of the Speaking test. Here is huge collection of IELTS Speaking question prompts we put together at Magoosh. Scroll to the bottom of the page to find the Part 2 prompts. Also, make sure to record your answers so you can find mistakes and listen for consistent problems (such as long pauses or verb tense errors) that you can try to fix. Complete at least two full Speaking interviews. In Magoosh, click on the green “Practice Speaking” button on your Dashboard. Answer each question the best you can immediately after reading it. Try not to “skip ahead” and look at upcoming questions, since you won’t know the next question on the exam! After completing the question set, watch the explanation videos. I recommend taking one of the practice tests in the The Official Cambridge Guide to IELTS. However, you can apply the same plan to a different practice test if you didn’t purchase this book. You can find some online IELTS practice tests here. You should time yourself strictly for each section. Put your pencil down after 60 minutes when you take your Writing exam, for example. No cheating! You need to see how much you can do within IELTS time limits. If at all possible, find someone to interview you for the Speaking section using the prompts from your practice test. 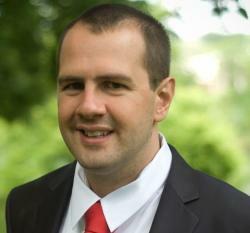 Ideally, you can get a native English speaker to ask the questions and provide some feedback. If that’s not an option, just have someone read the questions to you. In this case, it is critical to record your answers so you can analyze what you said. Please note: the Speaking exam has three parts. Make sure the practice exam you choose has sample questions for all three parts of the test. Some of the downloadable practice exams only include sample questions from Part 2 of the speaking exam (the “monologue” section). When you finish, you can use the answer key to mark your Reading and Listening answers. However, don’t evaluate your Writing and Speaking responses today. You should put these away until tomorrow (Day 7) so you will be refreshed and ready to analyze them carefully. Day 7: You’re almost done! Check your answers to the Writing and Speaking sections of yesterday’s practice test. Try to understand your errors. How could you improve what you said and wrote? You should use the official IELTS band descriptors for the speaking section to grade yourself. After you’ve checked your answers, you may want to review some of the strategy video lessons such as The SUN Method for Reading, or the APT Method for Listening. That said, it’s best to avoid “cramming” the day before the test. Don’t review vocabulary or do a lot of IELTS practice questions. Instead, get some rest! Being refreshed and focused tomorrow will help you most. Take a long walk or do something fun to take your mind off the exam. You’re going to do great tomorrow with all the hard work you put in this week! Can I write about personal experiences in order to support or refute an argument in my essay? Thank you in advance. The purpose of the academic writing task 2 is to show that you can write a formal 5-paragraph essay and look at different sides of an issue. You can use personal experience in the essay, but you should make sure to clearly show how that personal experience links to the prompt and how it supports your opinion. 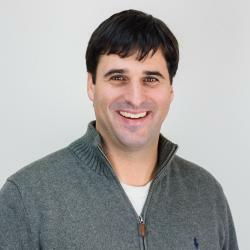 For example, you can talk about how your personal experience shaped your opinion, but you should also clearly show how your personal experiences are part of a wider trend and can be generalized to many people. Can this be used to prepare for the general training program? Our plan is more helpful for the IELTS Academic test. However, if you are preparing for the IELTS General test, our program may still be helpful to you! However, the IELTS Academic test has more challenging reading sections, so in these sections we only have more difficult passages. If you are taking the General test, you will see these types of question on the exam, but we don’t have easier questions, so our prep doesn’t fully reflect the format of your test. For the writing section, we have content that is for both Academic and General test-takers, but the questions and lessons don’t overlap. We’ve clearly titled the different content areas, so you should be able to navigate these differences pretty easily. 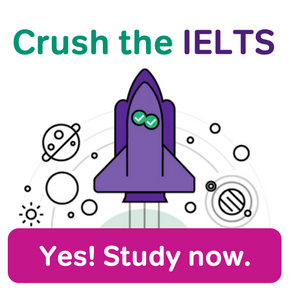 If you’re still not sure, I’d recommend checking out our IELTS program with our limited 7-day free trial in order to see if it’s right for you. Magoosh’s Guide to the IELTS exam. As you see, the total band score is calculated based on the average of your individual section scores. If the average is in between whole numbers, then they will round to a .5.